Parents who smoke could be exposing their children to worrying levels of nicotine through household dust. A team at San Diego State University found tobacco trapped in household dust could expose children to the equivalent of several hours of smoking. Levels were significant even when parents smoked outdoors. The study, published in Tobacco Control, says smoke particles can cause a range of smoke-related illnesses such as asthma and sudden infant death. It shows infants can be exposed to contaminants months after smoking has occured. The report said children are more vulnerable to inhaling this type of second hand smoke because they spend more time indoors, are in close physical contact with the smoker, have higher breathing rates than adults and may swallow contaminated items. Dr Georg Matt and colleagues studied 49 homes with an infant aged between two and 12 months old. They took samples of dust, surfaces, the child's hair and urine, and placed nicotine monitors in the child's bedroom and the main living room. They found in homes where the parents smoked outside levels of tobacco contaminants were still up to seven times higher than in houses where neither parent smoked. In homes where adults smoked inside, tobacco toxicity levels were up to eight times higher than homes where parents smoked outside. Dr Matt told BBC News Online the study shows parents may be mistaken that smoking outdoors protects their children from second hand smoke exposure. "We need to start thinking about second hand smoke as more than just tobacco smoke that can be inhaled while someone smokes. "Secondhand smoke consists of particles so small they can enter the deep lung where they can cause havoc just because of their small size. Parents have to face up to the fact that while they smoke they are putting their children at risk. "And it is stored in carpets, furniture, ceiling tiles, dust, curtains and clothes." He said tobacco smoke is a complex mixture of some 4,000 chemical compounds, including eye and respiratory irritants, systemic toxicants, mutagens, carcinogens and reproductive toxicants. Amanda Sandford, Research Manager at Action on Smoking and Health, said the findings should be a 'wake up call' to parents. "If you want to do all you can to protect your children then the answer is to simply not smoke, she told BBc News Online. "Parents have to face up to the fact that while they smoke they are putting their children at risk." She said tobacco smoke is one known factor contributing towards the rising rates of asthma in children. It can also cause middle ear infection, lower respiratory tract infections, sudden infant death and cancer. Around 50% of children in the UK live in a house where at least one parent smokes. 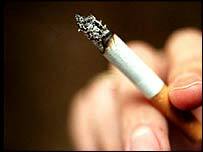 Up to 17,000 children are admitted to hospital each year as a result of passive smoking illnesses.